Here’s the news release from Metrolink, the agency that runs commuter rail in Southern California. Because this involves a potential fare increase up to seven percent, I want all readers to understand that Metrolink and Metro are separate agencies, although Metro is one of the five counties in So Cal that provides funding for Metrolink. The official notice is above. LOS ANGELES – The Metrolink Board of Directors approved staff to initiate a public outreach process for potential fare policy changes and a potential fare increase as one element to help close an existing $14.5 million funding gap for the Fiscal Year 13-14 budget. Additionally, a Title VI Disparate Impact and Disproportionate Burden Policy Thresholds will also be considered. The public will be asked to give feedback regarding an average system-wide fare increase of up to 7 percent, which would go into effect on or after July 1, 2013. $8.3 million for implementation and operation of positive train control (PTC). PTC refers to technology capable of intervening and automatically stopping a train, preventing train-to-train collisions. Other fare policy changes being contemplated include changing the current Weekend Pass to a Weekend Day Pass, as well as changes to the current fare policies for Personal Care Attendants (PCAs). The Weekend Day Pass would remain at just $10, valid for system-wide travel on either Saturday or Sunday. Metrolink is not the only commuter rail agency potentially being impacted by a fare increase. Even with the beginnings of a regional and national economic recovery, the current climate requires difficult decisions by transportation leaders to fund operations at a continued level to meet the region’s transportation needs. Many transportation providers across the country are facing similar challenges and have responded by raising fares by up to 25%. The Disparate Impact and Disproportionate Burden Policies set thresholds that determine when a change in fares or service will result in adverse effects for minority or low income riders. As a recipient of Federal Transit Administration (FTA) funding, Metrolink is required to comply with Title VI of the Civil Rights Act of 1964 and to carry out the United States Department of Transportation’s Title VI regulations. Comments and suggestions on the proposed fare increase, fare policy changes and Title VI policies may be submitted orally or in writing at a public hearing to be held on June 14, 2013 at a meeting of the Metrolink Board of Directors or submitted in advance (by June 12, 2013 at noon) of the public hearing by clicking on the “eComment” option atwww.metrolinktrains.com/ecomments. 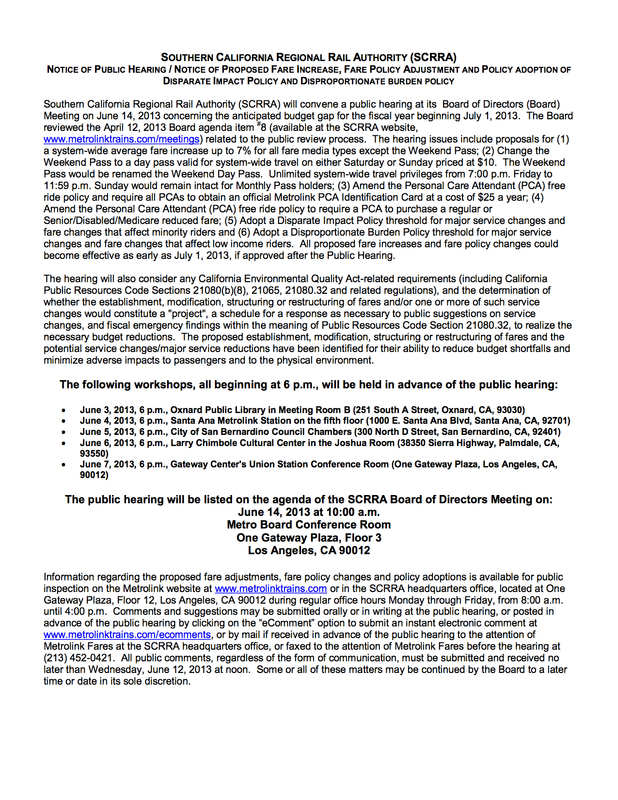 Comments can also be submitted by mail in advance of the public hearing by sending feedback to the attention of “Metrolink Fares” at the SCRRA headquarters located at One Gateway Plaza, Floor 12, Los Angeles, CA or faxed to the attention of “Metrolink Fares” at (213) 452-0429. No public comments will be considered after the public hearing scheduled for June 14, 2013 begins. RIP Weekend Pass. It was fun while it lasted. I’m most definitely not riding anymore if they increase the fare. “…thresholds that determine when a change in fares or service will result in adverse effects for minority or low income riders”? So, working class Caucasian riders don’t also suffer when fares are raised? This smells of reverse discrimination to me!